Aquatic Therapy At Polaris Physical Therapy – Aquatic Therapy, using the Aquaciser Underwater Treadmill System, permits patients of varying levels of ability the opportunity to increase strength and mobility while being supported by water’s natural buoyancy, making therapy safe and comfortable. 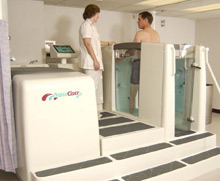 Water temperature and depth as well as treadmill speed and direction are tailored to the individual patient. Medicare and most private insurance cover Aquatic Therapy. Benefits Of Aquatic Therapy – Water provides resistance throughout a given range of motion, in all places of movement, providing a hydrokinetic exercise. Because water is so much more viscous than air, it is possible to prescribe therapeutic exercise at a relatively vigorous and intense level within a very protective environment. Patients with a variety of conditions can benefit from Aquatic Therapy including those who have undergone joint replacement, or who have sports or orthopedic injuries, chronic pain, or gait dysfunctions, just to name a few. The system also helps patients improve circulation, decrease pain and stiffness, increase range of motion and improve balance. Preparing For Your Aquatic Therapy – At Polaris Physical Therapy, all you need to bring is your bathing suit and we take care of the rest. Private changing / shower areas are available and your Aquatic Therapy session can be made private. Getting into the Aquaciser is easy because the heated water remains in the reservoir until you are comfortably seated inside. Questions – If you have any questions about our Aquatic Therapy Program, please call us at (614) 433-0264 or just stop by. Aquatic Therapy is available only at our Polaris Clinic.